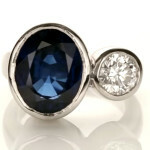 A very fine cut Blue Sapphire which is an especially unique and precious gemstone is appropriate for horoscopes with rising sign ascendant Taurus, Libra, Capricorn & Aquarius. 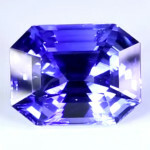 A very fine cut Blue Sapphire which is an especially unique and precious gemstone is appropriate for horoscopes with rising sign ascendant Taurus, Libra, Capricorn & Aquarius. According to Vedic Astrology the Blue Sapphire gemstone represents the planet Saturn (Shani). It’s a very powerful and effective measure and gives such an effect to the wearer that he or she can achieve unheard of success of a grand magnitude. As per the ancient astrological treatises Saturn is favourable towards hard-working people. It is inaccurate to state that Saturn gives you any success without doing hard work. In-fact the people who are unable to work hard don’t stand to get the full benefits of a Blue Sapphire, It is of paramount importance that one gets an accurate and expert reading of his or her horoscope by an experienced Astrologer before wearing the Blue Sapphire. Please bear in mind that if this gemstone is not suitable to your planets it can wreak havoc and bring about huge destructive effects too.